Molly MacMorris-Adix cuts the cake for the Annual Birthday Party ! Birthdays are incredibly significant cultural events all around the world from the first to the last, and the powerful memories associated with birthdays are immeasurable. Throughout life we delight in and value the celebration of growth that is most evident in childhood. To be excluded from this cultural expectation can leave anyone feeling unimportant, slighted, or insignificant. Unfortunately, many of the patients at Holy Family Services do not have the resources to provide their children with annual birthday parties as they might wish. From the founding of Holy Family in 1983, poverty and lack of access to health care was identified as a major injustice facing large portions of the local population. In 2010, Hidalgo County had the highest poverty level in the entire United States, with 40 percent of all residents living below the federal poverty level. In response, Holy Family works hard to provide affordable and supportive maternal care that is empowering for women and families with few to no resources. There is also a keen sense of the significance behind the celebration of birth and growth at Holy Family. For this reason, the founding Sisters decided to host an annual birthday party for all the children born at the birth center. The annual Holy Family Birthday Party has become a longstanding tradition as it continues today. For a volunteer this is both a stressful event to organize and a joyful event to provide for children. Annually, we have between 300 and 500 people arrive at Holy Family where we have games with prizes, face painting, music, pony rides, moon jumps, hotdogs, drinks, and of course birthday cake. As a non-profit we strive to involve the greater community, and with their generosity, Holy Family is able to provide the event with little to no cost to the organization. Certainly, we could never charge an entrance fee on principal. Thus, this event requires diligent preparation outside of our day-to-day responsibilities in running a prenatal clinic and birth center! Yet when the day arrives, it is clear that the plethora of smiles and laughter are worth the extra work. This past year, the birthday party held significant importance to me because not only am I a volunteer but I was also born at Holy Family. My mom had been working at Holy Family as a midwife when I arrived at 10:36pm on May 19th, 1987 weighing 8lbs 10oz (statistics I verified in the original birth log). My mom’s midwife was Sister Angela, one of the founding Sisters of Holy Family who served as the birth center’s director for more than 20 years. By the time I was 2 years old, my family moved to Oregon where I grew up. I returned to Holy Family in September 2009 to volunteer through Catholic Volunteer Network and AmeriCorps. After graduating from college, I found myself in a time of major transition and uncertainty. I took solace in the feeling of returning home to my place of birth. This was no more evident to me than when I attended my first Holy Family birthday party. After the months of preparation, the day of the birthday party was very exciting and almost a blur, waking up very early to set up the grounds and prepare for the party to start. The majority of tasks were basic necessities such as posting signs for trash and bathrooms, setting up chairs, stuffing and hanging piñatas, and prepping games. The far more interesting preparation happened in the kitchen where gallons of lemonade and fruit punch are made and 500 hotdogs are boiled and individually wrapped in napkins ready to serve. Understandably, after a couple of hours in the kitchen, most volunteers have had their fill of hot dogs to last them through the next year! As the party started and people began to arrive, all the volunteers dispersed to run different games, and I headed to face painting. Before I knew it I had painted faces for more than two hours! In that time, I not only took my simple artistic skills to new heights with requests for elaborate horses and unicorns, I also learned a significant amount about local high school pride and rivalries. I had a lot of specific requests for Weslaco Panther paws (purple and white) or Weslaco East Wildcat paws (purple and black), and I was imparted with the critical importance of not getting them confused! Even the high school spirit of 5 year olds can be inspiring. Eventually I found myself preparing to cut the birthday cake surrounded by children beaming with joy, and a wave of pride and emotion hit me: I realized how much I was growing in this year of service and how passionate I was about this Holy Family. I realized I couldn’t be prouder of the positive impact Holy Family has on these families and my involvement here where I was born. This birthday party that provides joy for so many had also become a personal milestone. 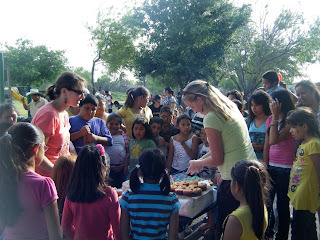 This was my birthday party too, and I couldn’t have been happier celebrating and serving the children surrounding me.